Basically, it’s important for you to climb with someone stronger and more experienced than you. Your new coach should watch out for and correct any errors you might be making. 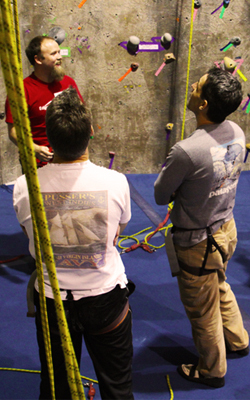 Having someone help point out climbing mistakes will help you crush more, faster. What to do? There’s a few choices, you can buddy up with fellow Edgeworks member who are willing to climb with you. Also, if you’re up for it, there’s a more structured option: getting coaching through Rock Sessions or ProRock. One of the best ways to improve your climbing is to find a mentor, a coach, who can help you set up your training schedules. Until you’ve got your own, you can take this Climbing Tip from the Edgeworks Team Coach, Jon Manz. “One important aspect of improving is to manage your training cycles,” explains Jon, “don’t focus on strength every time you train. Vary your work out.” Essentially, we have to establish training days to build important and specific climbing skills and muscles. On day 1, focus on strength; hit up the bouldering wall and weights. You’re looking to increase your strength. Day 2 is a power-endurance day. You’re going to head over to roped routes and climb at a consistently hard level (but not your hardest), while increasing your volume of climbing. On Day 3, it’s all about endurance. Here’s where you focus on the traverse. Stay on the wall as long as you can. Follow this cycle with a good rest day and repeat. Here’s what to do: While traversing, pay attention to your fingers and how much you’re bending your knuckles. The idea is to climb on your fingertips while keeping your knuckles flatter. Keep your hand open and knuckles flat. This will build up your slopper strength and increase your ability to climb hard. Having your knuckles bent requires extra energy and increases the likelihood of injury. 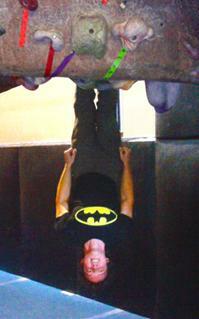 Three Steps to Crushing… BATMAN STYLE! 1. Sure the tool belt is awesome. But, the mind is the most important tool for defeating your enemies. You wanna crush your project? Use yo’ mind! 2. You think my good looks and muscles got me this far? Yeah, they help, but impeccable technique always beats brute force. I mean look how many times I’ve wooped Superman! 3. It’s all about priorities. You don’t see me taking a day off of crime-fighting to hit the Go-Kart track. If you want to get better at climbing, you need to climb more. Period. There you have it. Three easy steps to improve your climbing. Now, if you’ll excuse me, I’ve got to stop the Joker. Even though off the rock, you’re a pretty adept breather, this month’s tip is reminding you to keep it up while you’re climbing too. “It’s easy to forget how important breathing is,” points out Ken Brukhart, “you’re focused on a tough move so you forget. It happens to everyone.” Even experienced climbers need a friendly nudge to inhale.